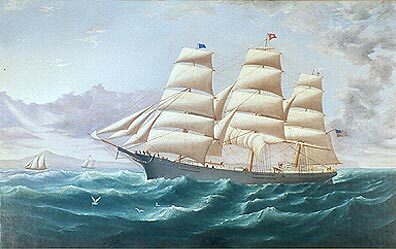 The Phineas Pendleton was built in 1866 at Dunning Yard in Brewer, Maine, and was named for a Searsport captain, whose son Phineas Pendleton Jr. was her captain until 1873. 1332 tons, 185'x 37' x 23' Lost by fire at Manila in 1885. Liverpool artist Charles Waldron specialized in paintings for the American market.